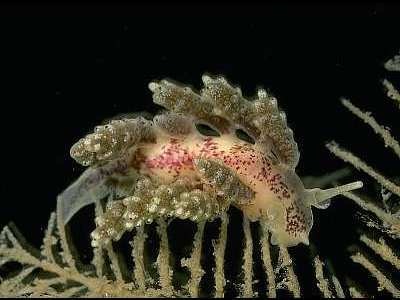 Description: A small Doto nudibranch, with dark red pigment spots on the cerata and with many subcutaneous white glands in the tips of the tubercles. The body and cerata are white, with scattered, elongate, ill-defined pigment spots on the body. There is a conspicuous circular area clear of pigment around the bases of the cerata. The digestive gland in the cerata is grey-brown in colour. Habitat: Doto hydrallmaniae feeds on the hydroid Hydrallmania falcata, a hydroid found mostly on rock surfaces, stones and pebbles in the circalittoral zone, especially in areas subject to scour from mobile sand or gravel. The animals live, and lay narrow, tightly coiled, concertinas of eggs on the stems of the hydroid. Distribution: Only recently described from the Isle of Man, Irish Sea, but animals feeding on Hydrallmania and therefore presumably conspecific, have been recorded from all round the British Isles. Large, dark red pigment spots on the tubercles. Dark red marks on the inner faces of the cerata. Picton, B.E. & Morrow, C.C. (2016). Doto hydrallmaniae Morrow, Thorpe & Picton, 1992. [In] Encyclopedia of Marine Life of Britain and Ireland.